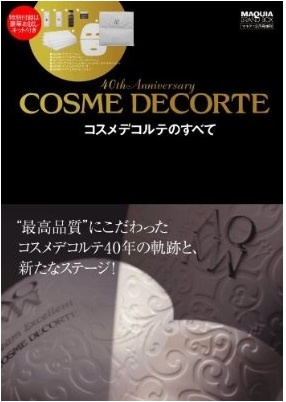 Cosme Decorte, which celebrates its 40th anniversary this year, will debut a new skincare line, AQ MW, on 16 November in Japan. "AQ MW" stands for "Absolute Quality Miracle Wonder" and is targeted at ladies in their 30s. 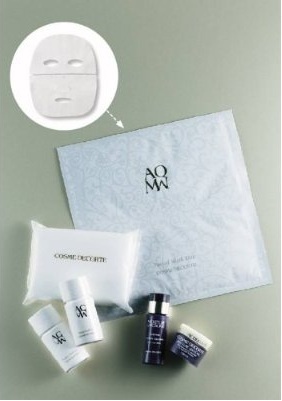 The elegant product packaging, which looks like sculpted white marble, is a special collaboration with Marcel Wanders. The brand tagline translates roughly as "For skin, a miraculous surprise". Maquia will publish a Cosme Decorte 40th Anniversary Brand Box (1300yen) on 19 November in Japan. It comes with an AQ MW Repair Emulsion 14ml, AQ MW Repair Lotion 14ml, AQ MW Facial Mask Duo (1 use), Moisture Liposome 9ml, Moisture Liposome Cream 6g and Facial Pure Cotton (4 sheets). Amazon Japan has this listed. Unfortunately, it looks like Kinokuniya Singapore will not be bringing this in. AQ MW packaging looks so pretty!!! I wonder if it's suitable for SG climate. BTW, have you heard of THREE skincare? I saw this brand & samples in Biteki's mag. I do not know how to use the samples. Three is a relatively new Japanese beauty brand that started with makeup and then recently released a skincare line. I'm not sure which samples are included in the Biteki mag.